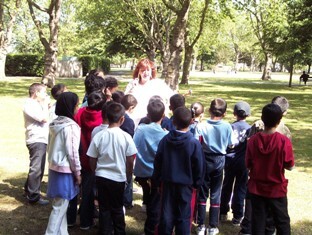 Year Three children at Shaftesbury Primary School, in West Ham, spent more than a month getting familiar with West Ham Park, which is just a short walk away from their school. They visited the park several times, learning about the trees there, and watching a puppet show in the playground. They also used the website to find out a lot about the history of the park. In the eighteenth century, the land belonged to a famous botanist, Dr Fothergill, who made a botanic garden there, which was more famous than Kew Gardens. To complete their project the children in the three classes made up plays about the park's history, and wrote raps about what a wonderful place the park was.